Just received a text message from my parents who are currently on a Mediterreanian cruise. My mother, concerned about seasickness, wasn’t too keen on the whole two-weeks-on-a-ship idea and for weeks, nay, months my father seemed to be fighting a losing battle trying to persuade her to go. But crystalised gingers saved the day. Mum is convinced they cure all ills. So long as Mum had her gingers she was willing to give the cruise a go. Yesterday, the ship docked in Gibraltar and my Mum was mugged by a large barbary monkey. The malicious creature knew what it was looking for. It left her with her wallet, glasses and camera but vanished down the cliff face clutching her precious gingers. Poor Mum! 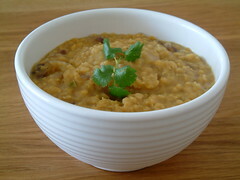 Dinner this evening was dhal and nann. Have tried many variations of this dish. They all seem to work! This was the concoction tonight. Fry the onion, garlic, ginger, chilli and spices in the oil until the onion has softened. Add the lentils. Fry for 1 more minute. Add 300ml of boiling water and stir. Simmer until lentils have absorbed the water and are soft. More water may be required. Serve sprinkled with fresh coriander (more than the picture!). Oh you made me laugh! More adventures from your parents please! Is your mum ok? Ginger really is a great cure for sea-sickness. Don’t know why it works, but it does. Chewing on candied ginger has saved my stomach on numerous fishing trips. Your ginger and dhal sounds delicious! You asked about dandelion flowers on my blog. I have asked around and they are edible – though youhave to chose the smaller plants for some taste reason. There are recipes to deep fry them which sound fantastic. Holler – Other than an eternal grudge against monkeys, Mum is just fine, thanks!